Poll of the Day > Ivanka Trump is OUTRAGED after a look a like MODEL depicted her VACUUMING!!! 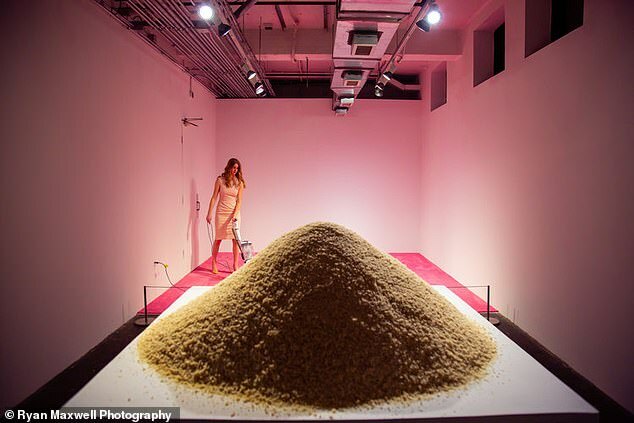 Ivanka Trump is none too happy after an exhibition that depicts a look a like of her vaccuming CRUMBS thrown at her by gallery visitors!! The installation, sponsored by Cultural D.C and housed less than a mile from the White House features a woman bearing a striking resemblance to Ivanka cleaning a plush pink carpet with a vacuum!! 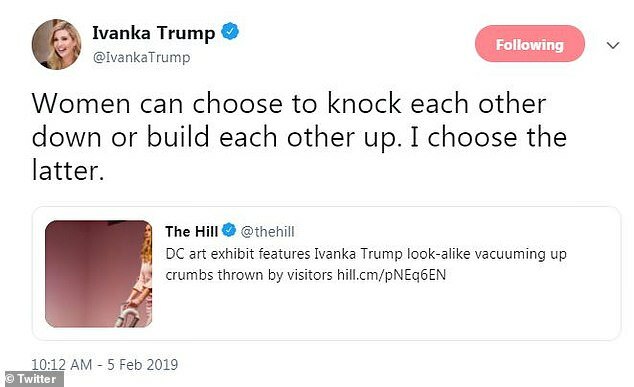 Jennifer Rubbell, the artiest behidn this said the display was meant to explore "our relationship with Ivanka" while provoking a debate about "our complicity in her role playing"
The 37 y/o was not impressed and said "Women can choose to knock each other down or build each other up. I choose the latter"
The exhibit states it was inspired by a figure whose public persona incorporates "an almost comically wide range of feminine identities, daughter, wife, mother, sister, model, working mom, blonde" and that it is "simultaneously a visual celebration of a contemporary feminine icon; a portrait of our own relationship to that figure; and a questioning of our complicity in her role playing"
Viewers will spot a white pedestal with a huge pile of crumbs and visitors are invited to throw more crumbs on top of it and watch as the "elegant" ivanka vacuums up the mess and her smile never wavering. 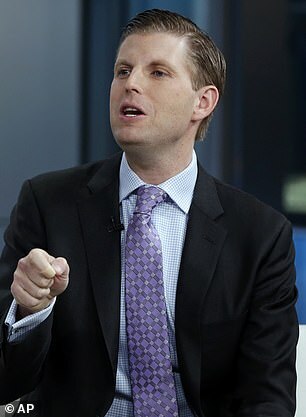 He went on Fox & Friends and said "These leftists called up a modelling agency, saying 'you know what, i want to get a nice woman to come stand on a carpet, with a vacuum of all things, so that our people can throw food and crumbs to mimic a powerful woman who has done more for woman than probably anyone in washington dc. Think about the hypocrisy. They label themselves as party fo women yet they're throwing food, garbage at a woman on a carpet holding a vacuum who really does care and fought for women". Jennifer defended the exhibit who said she wasn't out to offend Ivanka who said "usually the qualities of feminism and feminity are seen in opposition. most women clearly lean toward one side or the other in their self presentation." Who's Hotter: Ivanka or the Model? Why do i feel like she really meant to say "ladder." Where she like to climb to the top of. If every votes the model, then we Twitter this to ivanka, she could be outraged by us and we would be famous! I just looked at the model. I don't see how she looks like Ivanka. She just looks like a blonde next to a vacuum. The model is prettier but Ivanka has a nicer figure and much better chesticles so she get my vote.